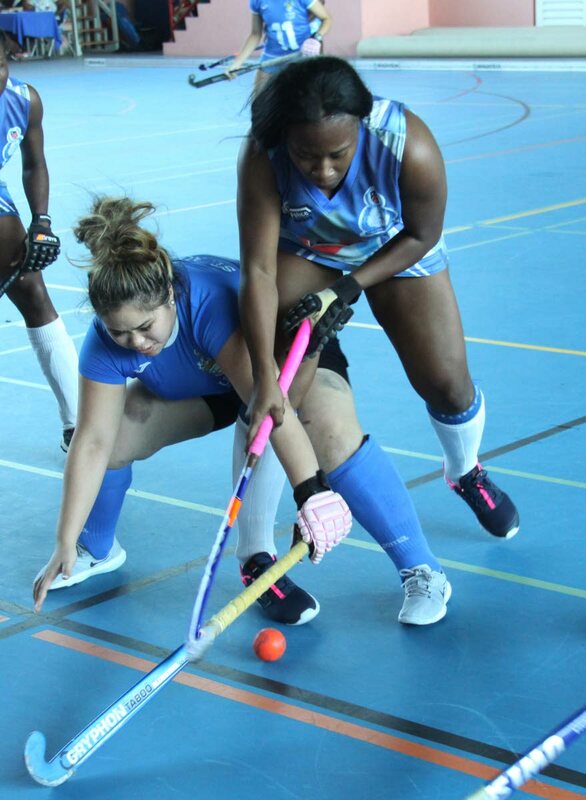 WAYNE Legerton continued his splendid scoring form by registering a hat-trick for Police as they whipped Fatima (5-2) yesterday in the University of West Indies (UWI) Invitational Indoor Hockey Tournament, at UWISPEC, St. Augustine. Police have won two consecutive matches behind the efforts of Legerton, who scored three second-half goals. Fatima got the go-ahead goal from Che Modest in the ninth minute which lasted only five minutes when Ryan Ramberan equalised for Police just before the half-time interval. After the resumption, Ghardel Elcock reclaimed Fatima’s lead in the 16th minute. Then, the Legerton show started with him blazing goals in the 18th, 19th and 30th. The prolific scorer has now tallied seven goals in three matches. Michael O’Connor scored the other goal for Police in the (26th). In their previous match, Police recorded a comfortable (5-2) victory over Paragon. Paragon opened the scoring through Kiel Murray in the fourth minute but the officers pulled a goal back with Ryan Ramberan’s goal in the 11th minute. TT player Akim Toussaint regained the lead for Paragon in the 13th minute to make it (2-1) but it only lasted one minute as Justin Beharry tied it up at 2-2 with mere seconds before half-time. Kerwin Hume gave the servicemen the (3-2) advantage with his goal in the 19th minute then his comrade Wayne Legerton assured his team of the victory with a brace of goals in minute 21 and 27. Defending women champions Paragon suffered a dent in their hope of securing the top female trophy for one more year. They lost (3-5) to Ventures and (2-3) to the host team UWI yesterday. UWI (women) made it two victories on the day with a slim one nil victory against Police. The lone goal of the match coming from Krizia Layne in the 22nd minute. Ventures made things interesting with the women by securing identical (5-3) victories against Magnolias Magtastic and Paragon. Magnolias Pink spanked Notre Dame (11-0) which is the largest margin of victory in the tournament thus far. Shaniah De Freitas blasted a beaver-trick (1st, 26th, 29th & 30th; whilst her sister Savannah De Freitas (4th, 5th), Kaitlyn Olton (9th, 21st) and Samantha Olton (18th, 28th) scored two goals each. Amie Olton (3rd) was also among the scorers. QPCC I remained unbeaten after three matches when they won a thriller (6-5) against Supernova. Already on four goals for the tournament, Aidan De Gannes once again led from the front with a double in minute 13 and 15, also scoring two goals were Jerazeno Bell in the 24th and 26th. Evan Farrell (2nd) and Shawn Lee Quay (30th) were the other scorers for the Parkites. Supernova scorers were Jamarj Assanah (5th), Kareem McKenzie (10th, 30th) Omar Hopkinson (21st) and Warren Williams (28th). QPCC’s earlier match was a comfortable (4-0) victory over Malvern. Goal scorers were Robert France (7th); Shawn Lee Quay (18th) Kadeem Fortune (26th) and Evan Farrell (30th). Reply to "Legerton hat-trick helps Police beat Fatima 5-2"